Don't overlook the significance of the very last verse. The Lord brought this passage to me some time back. What he helped me to see is that when we are hearing the Father's heart (regarding His house/kingdom matters) and seeking to fulfill the will of the Father, He allows us to operate with the authority of having his "signet." We are only acting as His agents with His "signet ring." Initially I shrank back from thinking God would vest this authority in his children. But He kept bringing me back to this passage. I'm not talking "name it claim it" stuff here. I'm talking about hearing the Father's heart regarding any kingdom building issue and knowing that we have the full weight of His authority behind us regarding anything the enemy throws at us o/! Walking in this new reality has been exciting and very humbling. My wife and I are seeing people's hearts change as we are seeking to plant the gospel in the field where the Father has placed us. What John writes here is key. When we discover what it means to walk in Jesus' authority, we will see hearts changed and lives transformed. After all, the Great Commission begins, "All authority in heaven and on earth has been given to me. 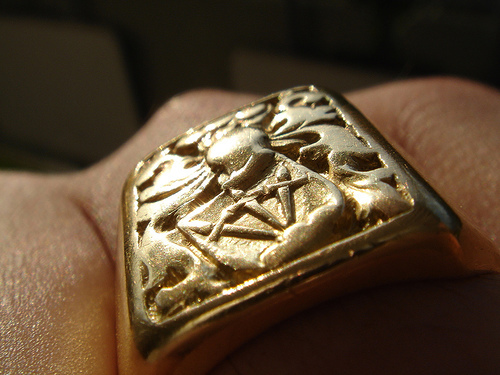 Go therefore and make disciples…"
The signet ring was a symbol of kingship and used to endorse or seal official documents. The illustration I like is that of an ambassador who speaks and acts on behalf of his government. He is an ordinary person, but when acting in the authority he has been given, he can change the course of nations. We have been given the right to use Jesus' name in all kinds of circumstance. We can speak and act in the name of the King of kings. It’s true that we are ambassadors, speaking and acting on the King’s behalf. Amazingly we are also a royal priesthood. We are members of the royal family and household. We are able to enter the holy place where his glory rests. Somehow it’s easy to forget all these great truths in our day-by-day lives at work, at home, with friends. But we need to remember. An ambassador who has forgotten his place and role is unable to function. We are royal, priestly ambassadors from the King of Kings. Ambassadors to the world. Wow!